After a bit of a nightmare journey which saw us having to return home an hour into our journey to Manchester to retrieve my (Lucy) driving license (apparently they won’t allow me to drive around here without it, how rude!) We got diverted by roadworks but eventually found our hotel with a huge comfy bed yay! Glen was well away in lala land but I couldn’t sleep. Early up to get to the airport, stood in line for ages to be told as we didn’t have a hotel booked for the first night we were denied permission to fly. Cue a mad 20 mins trying to get the airport internet to work and book a hotel, we eventually bribed it with a credit card! Long 7.5 hour flight to Newark then the connecting flight was delayed to Atlanta by an hour so 4 hours waiting before another 2.5 hour flight. Ps Glen sleeps on planes, I do not so by this time I was kind of tired. Caught the sky train which should be called zippy (but wasn’t, I checked) to the car rental then had a terrible drive in the rain for 3 hours to hotel. Stopped for dinner at JR Crickets on way which taught me that mild here means burn your skin off your lips :/ Got to hotel, Days Inn, they have a microwave and fridge in there lol. Very tired room but comfy bed which I collapsed on. 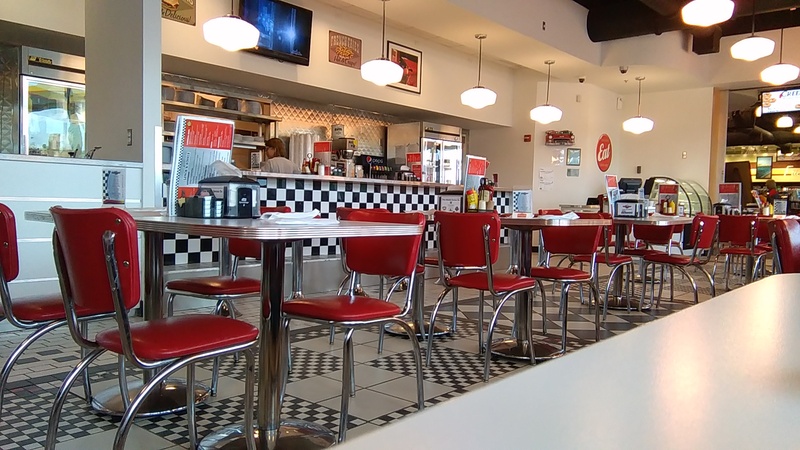 This entry was posted in America, Recent Posts, Travel and tagged Alabama, America, Catfish, Diner, Georgia, NOLA, Peanuts, USA on April 18, 2015 by Glen Hayes.